The Best Persuasive Argument of 2015 was not presented in the form of the standard five paragraph essay. Instead, the best persuasive argument made this year featured 1000 musicians playing the song “Learn to Fly” in a field in order to persuade the rock band Foo Fighters to play a concert in a small town in Italy. The entire project was the brainchild of Fabio Zaffagnini and his creative team. 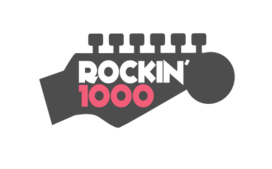 They named themselves the Rockin’1000 with the tag line: Romanga Calling the Foo Fighters and they extended an invitation to the band perform in Cesena, Italy. The diary on their website chronicles how they raised $45,000 in order to film their appeal. PART #1 Introduce the topic of the paper and the thesis statement. PART #3 Prove the thesis with your arguments. PART #4 Disprove your opponent’s arguments. PART #5 End the essay. The video: (Fabio speaking) “To be true…this (gestures to musicians) is just to 5 people They just did for one song…your song. Our call is to ask you, the Foo Fighters, to come and play for us…Please… (begging motion)….Make noise!…. (CROWD) Foo Fighters! Foo Fighters! Meeting the requirements of an argumentative essay is not the reason for writing an argumentative essay, although there are students who are convinced that requirements = reasons. The 26 million views of this video on YouTube confirms the truth in Grohl’s statement. There will be more views as this video appeal was included in many of the end of the year “best” moments for 2015 (Google). The standard 5 paragraph essay never reaches that kind of audience. Consider, then, if this was the best argument for 2015, what can students do to persuade someone to take action in 2016…and what format would make the best persuasive argument?